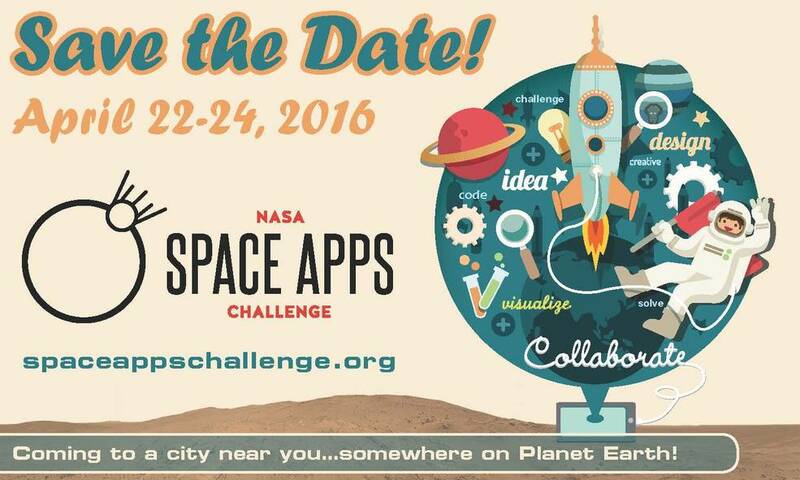 For those interested in the intersection of space advocacy, software applications and commercial business activities, the 2016 NASA Space Apps Challenge, which was held from April 22nd - 24th at various locations around the world, provided an interesting canvas of exploratory ideas for our next great space age. First held in April 2012, the international hackathon partnered NASA with small groups engaged in organized challenges to develop innovative solutions focused around the use of NASA data. Local events took place at 193 other locations in 72 countries and were expected to attract approximately 15,000 participants. Vesta Rainbow - A generic digital online tool designed to build constant scale natural boundary (CSNB) maps of Vesta (one of the largest objects in the asteroid belt) utilizing the digital elevation model (DEM) found through Vesta Trek. According to the website, tool could be applicable to any 2D or 3D surfaces (not necessarily terrains) in order to "visualise the dissipation of potential. An example could be “virtual flood” analysis of income distribution on a city map." Kid on the Moon - An interactive children's app which allows smartphones and tablets to locate the Moon any time of the day (even when the Moon is below the horizon) and unlock current lunar data (phase, distance, etc), and other items. As well, team Space Off (which explored ways to adapt common gym tools to reduced gravity environments and design a workout routine to minimize bone and muscular loss) received a Peoples Choice nomination and will also move on to global judging. According to Toronto Space Apps Challenge organizer James Costa, the real Toronto challenge was to organize a separate one-day youth event for kids ages 7-15, which was held on Saturday, April 23rd, in conjunction with, but at a separate location, from the main event. As outlined on the 2016 Toronto Space Apps Youth website, "It’s a day set with unique challenges that encourages kids to use their hands and brains to explore and learn about space like never before." The youth event involved robotics, space-related arts and crafts and coding workshops. Don't just stand there. Click on the image to re-tweet and show your support. Photo's c/o @teresa_sing. 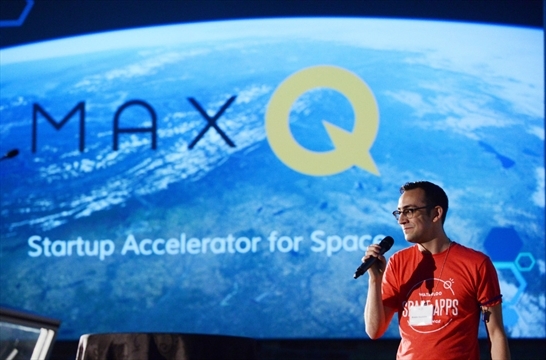 Meanwhile, over at the NASA space apps Waterloo location, the big news was the MaxQ "business accelerator for space start-ups," which formally announced a pilot program for three to five teams, which will begin in September, 2016 and run for six months. Teams of 2-10 founders, of whom one must be willing to be at Communitech in Kitchener-Waterloo full-time for the duration of the program. Teams focused on developing "downstream applications" or software applications able to run on existing hardware, focused around the areas of Earth observation, geo-analytics, big data, geomatics, wearables and/ or bio-medicine. Teams with a working prototype that is close or ready to be launched into the market. In exchange, the company offers "an intensive program of mentoring, business development assistance and access to industry experts." The program is open to Canadian citizens and Canadian residents only. According to MaxQ president Brodie Houlette, "We want to make Kitchener/ Waterloo the epicenter for Canadian space activities." He said the Canadian accelerator will be modeled on the successful UK based Satellite Applications Catapult accelerator, which was established in May, 2013 by Innovate UK, a UK government agency. CEO Houlette giving a presentation at the Waterloo Space Apps Challenge on April 24th. MaxQ will be based in the Communitech innovation centre in Kitchener, Ontario, which has donated space for up to 20 people, according to the April 24th, 2016 The Record article, "New space-sector accelerator to touch down in Kitchener." Photo c/o B. Houlette. MaxQ founders include Houlette, Marc Boucher (the co-founder and CEO of SpaceRef.com), Robert Gissing (a co-founder, past director and past president of the Kwartzlab MakerSpace) and James Slifierz (the co-founder and CEO of SkyWatch Space Applications which, as outlined in the May 19th, 2014 post, "CDN "SkyWatch" wins "Best Use of Data" at Int'l Space Apps Challenge," won the 2014 Space apps challenge). No funders for the accelerator have so far been announced. The potential for a Canadian space focused accelerator has been discussed previously, most recently in the March 30th, 2016 post, "Changing Times; Space Start-up Accelerator Announced in Waterloo." 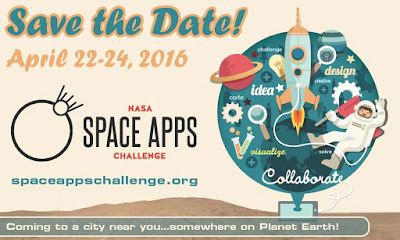 I just read your article about the 2016 NASA Space Apps Challenge from this past weekend and wanted to thank you for covering the event and sharing the details with a wider audience. I am one of the members of team Kid On The Moon. We had such a great experience collaborating and creating this app. It was inspiring to see so many teams, with a diverse range of skills, working together in a supportive environment to explore challenges and develop a variety of fascinating solutions. I am writing to please request your consideration in updating the description of the Kid On The Moon project in your article. Although what you described is completely accurate of the Book It To The Moon challenge, what our team developed in response with Kid On The Moon branched out to include more curiosity-building and STEAM elements, motor and sensory activities, and encouragement of using the app as a starting-point tool to engage the child in real-world experiences. 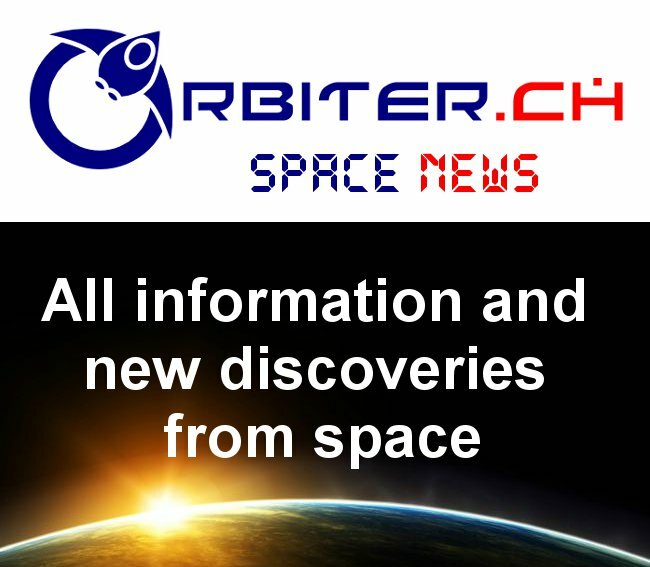 "An interactive and immersive tablet app for children 4-8 years old created to inspire the next generation of solar system explorers. Children become virtual astronauts; explore the moon's surface; discover stories, videos, and moon-related facts; and are encouraged to stay curious by using the Kid On The Moon app as a tool to engage in real-world STEAM experiences to keep learning about the moon, space, and science." Once again, it's wonderful that you covered this and are bringing attention to the Space Apps Challenge events. They truly spawn so much collaboration, innovation, building, and creative thinking that may not otherwise occur. I hope they continue to receive the support it requires to keep them happening each year. Thank you so much for taking the time to read this and I appreciate your consideration of my request to update our project's description in any way you see fit. We'll also have a :30 second video ready on Friday to submit to NASA for the global competition, and I would be happy to share it with you if you'd be interested in seeing it.